Come closer, look at the mirror. 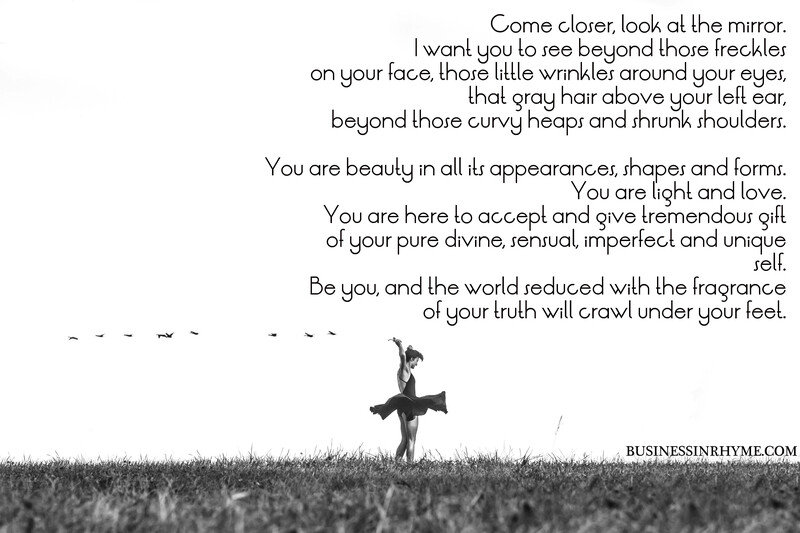 beyond those curvy heaps and shrunk shoulders. You are beauty in all its appearances, shapes and forms. You are light and love. of your truth will crawl under your feet. If you liked this post, please share! And if you are interested in getting more inspiration for your creativity, sign up for our free monthly newsletter. You are warrior of kindness. you observe and admire the world. of your own powerful potential. January 24, 2016 June 23, 2016 by Maja Todorovic, posted in Business in Rhyme, My personal rhyme - from time to time, Read, write, lead!, Write, create, innovate! Nordic, Greek and Roman mythologies are very well known and explored in literature – through science fiction and poetry writing, from anthropological, religious and ethnological point of view. Old Slavic mythology is lesser known and popular, yet very rich in folktales, rituals, mythological creatures. It was a part of the belief system that Old Slavs treasured and celebrated: a multi-theist system of Gods, spirits and “lower beings” that influenced each part of their lives. To old Slavs their Gods are the founts of life, power and happiness. Gods, worshiped for millennia gave the meaning to existence, and protective notion to old Slavs. They were celebrated through rituals and songs – similar to many indigenous traditions. In some remote Balkan regions, these rituals and songs are still present. Probably due to the reason that when old Slavs adopted Christianity, many of the old, Pagan customs found their place in the new belief system, just disguised under another name and purpose. My father, for example used to tell me about the songs and customs that were performed in his village during spring and summer – because peasants believed that it will influence the yield of the harvest and that it will help them to ‘cheer up’ the will of the Gods (like God Perun, that governed thunders and fire). In order to invoke the rain villagers would perform ritual: a girl, called do-do-la wearing a skirt made of fresh green knitted vines and small branches, sings and dances through the streets of the village, stopping at every house, where the hosts sprinkle water on her. Following and celebrating religious holidays actually still impacts agricultural activities in many Balkan regions. towards the sky with prayer for dull clouds. Bodies of trees are broken and bowed. leafs curled in sears, in the color of hell. It’s time for a Raingirl. adorned with wheat, flowers and grass. An orphan, as such adored among hearths. as messaged by the God of Thunder. in hope to imbibe a little bit of milk. When we will see a raingirl again? Once the Sun becomes this angry, heavy. In pain. Our ancestors, not only in Slavic traditions believed that songs and poems do have a tremendous power to help us sustain even the most difficult times – that type of strength we still can nourish inside ourselves. Myths are stories; stories narrated for a thousands of years, having life of their own in our minds and subconsciousness. They are reflection of our belief system, an eternal fight between evil and good, a struggle for achieving beyond perceived, understood and obvious. Mythology can relate to many religious rituals as well, where in the form of songs, poems and stories was used as a vehicle to explain to younger generations how people acquired speech, fire, grain, wine, oil, honey, agriculture, metalwork, and other skills and arts. In mythology everything is possible: existence of Gods, Goddesses, beings with supernatural powers and humans taking traits that makes them larger than life and heroes in our minds. 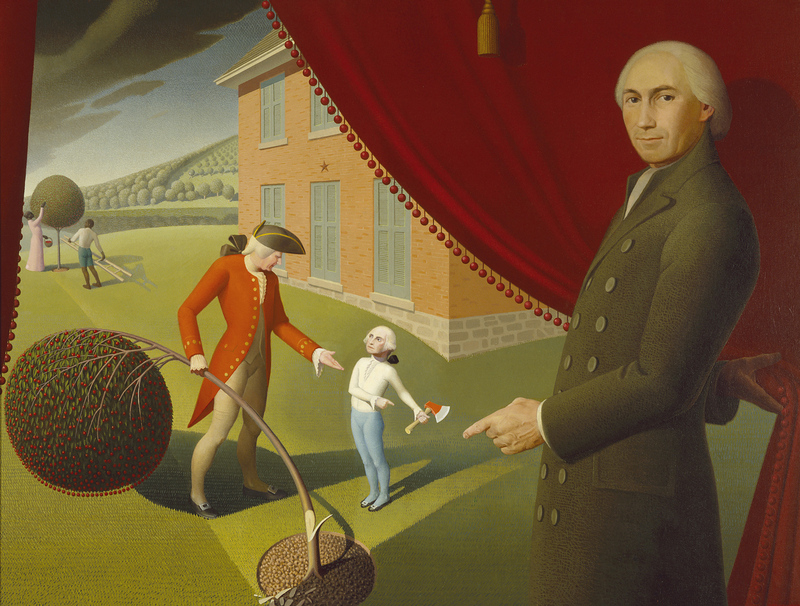 For example, Parson Weems created a myth about George Washington in the story of the cherry tree, describing an event that never took place, but used to illustrate the moral behavior of a young George. Many crafts, like astrology use the power of mythological creatures and language of symbolism to emphasize the archetypes of human nature, where even the heavenly bodies take on the roles of Gods, and as they “dance” in the sky they “plot” the scenes of our life events. Mythology was a communicating medium among indigenous people, as it can be found in ancient texts and it is foundation upon which modern culture has been built. But this is not where the power of mythology stops. It’s well established in the modern western cultures as classical scholar and professor Elizabeth Vandiver claims: Star Wars, Star Trek and other similar stories are myths as authentic as those found in Hesiod, Homer, and Ovid. They have the elements of classical mythological tales and are so engraved within our culture, that metaphors and psychological profiles defined, we often use in our everyday life as a reference. Yeats’s poem was inspired by a Greek myth about Zeus and Leda, the daughter of a king named Thestius. Zeus disguised as a swan seduces Leda and takes advantage of her. In the poem this event Yeats in every, tiny detail described very powerfully. And as we know how the myth continues, Leda gets pregnant and gives birth to Helen of Troy. Many men were enchanted by the Helen’s beauty and she becomes abducted by a young man named Paris that led to the Battle of Troy, the centerpiece of Homer’s Iliad. Yeats’s poem hides between the verses a drama that takes place in the tragic fall of Troy; it illustrates familiarity that Yeats had with artistic story of Leda and the swan, retold by sculptors and painters like Michelangelo and Leonardo Da Vinci. This poem was written in the same year Yeats was awarded the Nobel prize for literature in 1923. Here, he poses the question of predominant misuse of power and how an apocalyptic consequence that might have, beyond the possibility of what our mind can conceive. make story more “alive”, entertaining as people like myths: it captivates their attention and ignites imagination, lifting their experience to the level of adventure and pleasant uncertainty. Let your story become a myth.